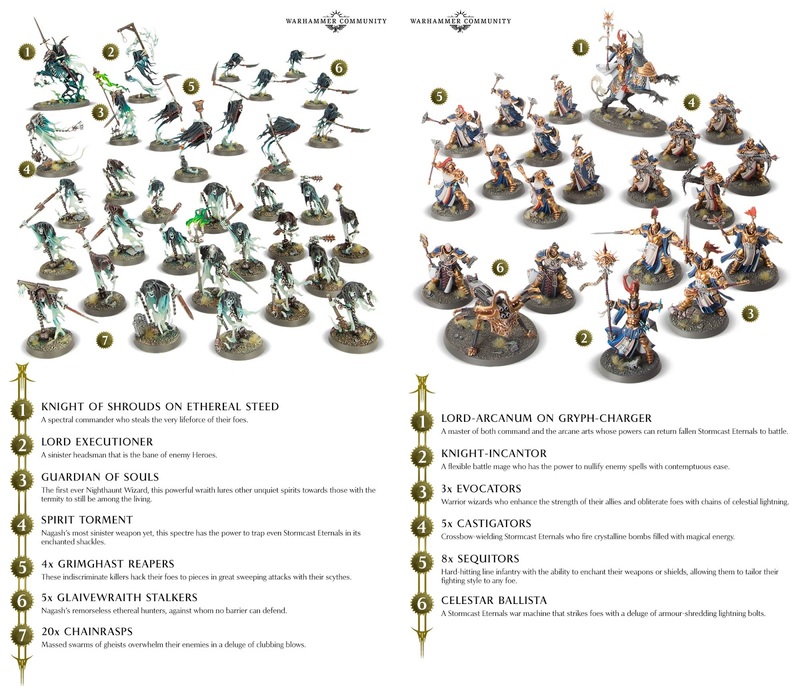 The new edition of Age of Sigmar is nearly upon us with the amazing new Soul Wars starter set! 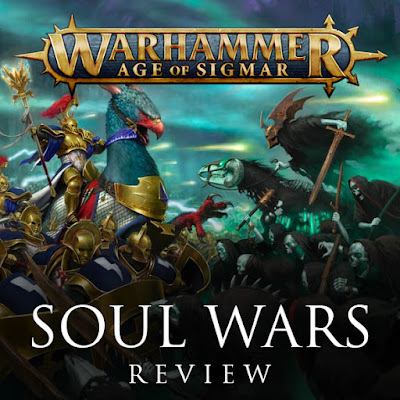 Replacing the existing starter set we've know for close to three years, Soul Wars brings us some amazing new Nighthaunt and Stormcast models, a nice new hardcover core rulebook, and a selection of other goodies. So, let's crack it open and take a look! To start things off, I'm dividing this review in half. Today's review will be about the boxset and the majority of the contents. The second review, next week, will be about the core rulebook itself. This is for two reasons. It would be an extremely long review if I did it all in one article, and secondly, I need the time to read through the entire rulebook for you, including all of the lore, and there's a lot of it. First things first, let's talk about that packaging. If you've read any of my other reviews you'd know I'm a sucker for a good packaging design and cover, and Soul Wars doesn't disappoint. The box itself is fairly hefty and feels like you're getting a veritable treasure trove worth of stuff just by picking it up alone. The whole thing is inside a slipcase with a very refined, sombre, and slick piece of cover art. The battle scene we've seen recently of the Stormcast and Nighthaunt is on there, but darkened down a ton, so that it almost just looks black from far away. That single Stormcast inside the diamond design (an awesome design trope that you'll see a lot of in the contents of the box) really stands out and grabs your attention. The simple "Soul Wars" title beneath it seals the deal. This definitely falls in line with what we've been seeing for AoS since Malign Portents came out. It has much more of an adult feel to it. 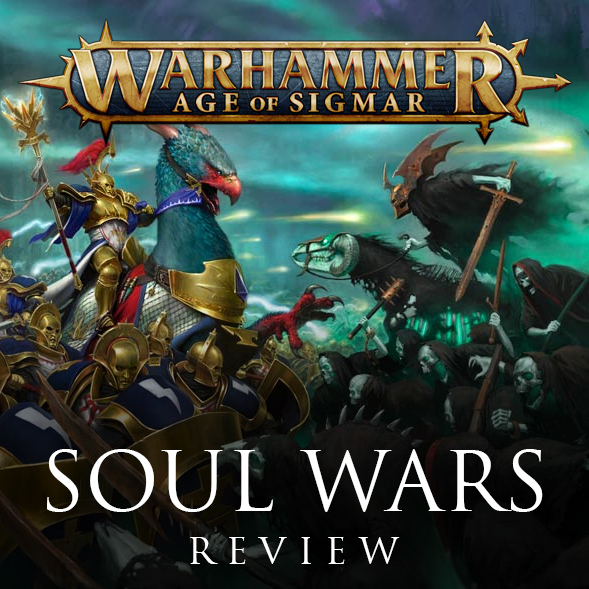 Where as the first starter set for AoS was loud and in your face, Soul Wars has a more ominous feeling to it. It practically promises dark deeds and secrets lie within. Even the savior figure on it, the Stormcast, has a sinister feel to it. Once we remove the slip cover we see the same battle scene, but this time in full, bright, color. This is, in fact, just printed on the box that contains the miniatures. This roughly inch and a half tall box contains all of the sprues, with a top that easily lifts away without damaging the box itself. This is something they have copied over from the Dark Imperium box of 40k last year, and good on them. It was a great idea. It looks awesome, feels premium, and protects the models from the books and the books from the models. Never be afraid to copy a good idea. Once you lift this box within a box away, don't worry, we'll come back to the models, you'll see the books beneath it. Nestled into the middle of the box, with cardboard bumpers on either side holding it in place, is the core rulebook. Again, what amazing cover art, but I'll come back to that in my review of the rulebook itself next week. Beneath this are the rest of the books and cards. Excluding the rulebook, we get three books, and two sets of warscroll cards. There is a Start Here book, which covers a bunch of the basics for someone completely new to AoS and wargaming in general. Then there are the core rules in their own saddle stapled soft cover book. These are all of the rules you need for the game, kind of like the four page pamphlet AoS used to have. This will be super convenient for taking to game night when you don't want to carry around the whole rulebook. None of the more advanced rules are in here though, so keep that in mind. Lastly, we have the campaign book for this boxset, the Battle for Glymmsforge, which I'll go into more detail here in a moment. The Warscroll cards have been redesigned to be in a horizontal format, something that people have been asking for for awhile now. This makes them much easier to read. The style of warscrolls have also been redesigned, with some fancy new cosmetic changes, including a picture of the model, kind of like the Shadespire cards. This looks cool, and also helps you with finding the card you need at a glance. For larger warscrolls, like the Lord-Arcanum on the Gryph-Charger, they've come up with a new double warscroll card that folds out. I'm assuming this is what they would go with for other suitably large warscrolls like Nagash, and Archaon in the future. It'll be interesting to see if any of the older factions get their cards updated to this format, or if it'll just be new releases going forward. Lastly in the stack of books and pamphlets is the instruction booklet for putting the models together. This is in full color and is very easy to follow along with. There are also very brief painting guides in there for each faction, going over what colors the recommend if you wanted to duplicate their paint schemes. That's not all though! When you remove the cardboard that was holding the books in place, which has some cool art printed on it by the way, you'll find even more. You also get a set of blue dice, a clear plastic ruler, an ad pamphlet for the other push fit model boxes coming out on release (like the Mymourn Banshees), and a mini book with the first chapter of Josh Reynolds tie in novel, Soul Wars. Okay, now we're done. That's a whole lot of stuff though. Let's take a deeper look at some of it. The Battle of Glymmsforge book acts as the narrative hook in the starter set. We get a brief overview of the setting as we've come to know it, as well as some of the events of Malign Portents and how the realm of Shyish works. A lot of this is similar to what we've seen already in the Malign Portents book, but it's a nice recap for newer players or anyone who didn't pick that up. It also covers the events of the Necroquake. After this we go into the city of Glymsforge itself. I always love when we get to explore one of Sigmar's cities, and this is the first that we've seen within Shyish. There are a ton of cool little details about how the city works, how it looks, and how it came to be. It then moves into some of the more recent history of the city. A great undead army was raised to conquer the city which was repulsed at great cost. During this battle there were three heroes, Knossus, Serafin, and Malendrek. Knossus and Serafin were greatly praised and taken up into Azyr by Sigmar's lightning before their deaths. In contrast, Melandrak was mostly forgotten and received little praise, despite fighting just as hard and heroically as the others. Over time he grew bitter about this, and that resentment was prayed upon by Nagash, who tricked him into betraying his former city. In the end it is Melandrak, now a Knight of Shrouds, who leads the Nighthaunt forces back to Glymsforge and must face Knossus and Serafin, now a Lord-Arcanum and Knight-Incantor respectively. The backstory on everything is really well done, and helps tie all the models in the set together nicely. The peek into the city though has to be my favorite part. After this each of the factions gets a bit of an overview. There are two pages which go over the new Stormcast Chamber, the Sancrosanct Chamber. They're essentially the Stormcast who have been in charge of the reforging process. They stand guard outside the reforging chambers and make sure everything goes correctly. Lately, more and more of the Stormcasts have begun to reject the reforging process and can escape as a Lightning Gheist. Then it's up to the mages of the Sancrosanct Chamber to track them down and either return them to the anvil or destroy them. The process is getting so bad that Sigmar has now decided that it is time for this Chamber to descend to the Mortal Realms and use their magic to try and find a way to fix the process. Because of this you'll often find them around magical events or fighting against the forces of undeath as they search for the key. Each of the units in the starter also get a single page of lore, which I'm sure will be expanded upon more at some point. The Nighthaunt get the same treatment as their golden enemies. The Nighthaunt legions are partially a result of the Necroquake, the event that resulted in both the Shyish Nadir and the presence of the Endless Spells. The ghostly legions always existed, but now they are more active then ever, with many spirits drawn back to the location of their mortal remains. Nagash enjoys enacting special punishments for the souls under his dominion, which is why many of the Nighthaunt units reflect that. One example given is of someone who committed regicide in life being given all of the regalia of royalty, but being invisible to everyone so they get none of the recognition. The units are broken down as well, with the Lord Executioner being a former executioner and the Spirit Torments former jailers. The Guardian of Souls are former wizards who dabbled in the necromantic arts in life, but turned away from them before damning themselves. Nagash cracks himself up. One of the coolest bits here is for the Lord Executioner. It talks about the very first Lord Executioner who was the head executioner for a powerful city, but grew tired of the work after many years. Wanting to live a normal life he retired into the nearby mountains, where later, the friends and family of a man wrongly executed under his charge track him down. There they disembowel him and hang him with his own entrails. Now in death he is constantly haunted by the souls of those he slayed in life, driving him to insanity. There are no rules in this book though, since all of them are on the warscroll cards instead. This was a little odd at first, but makes sense (why print it in two places) and frees up space in the book for more backstory. Now for the part a lot of people have been waiting for, the models. They all come neatly stacked in their own box, like I mentioned earlier. Inside you'll find three small sprues, and one large sprue for each faction, for a total of eight sprues, as well as a bag of most of the bases. Some of the larger bases are at the bottom of the main box, so don't lose those. 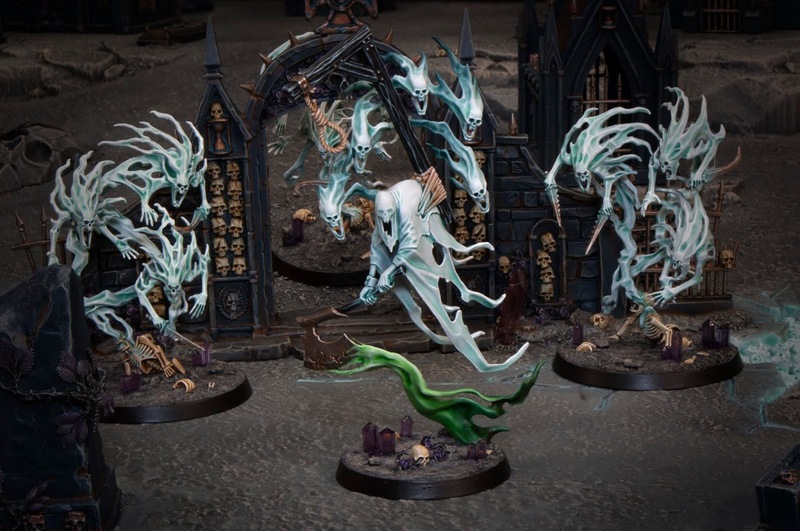 As I'm sure everyone is aware of by now, you get models for the Nighthaunt and the Stormcast Eternals. 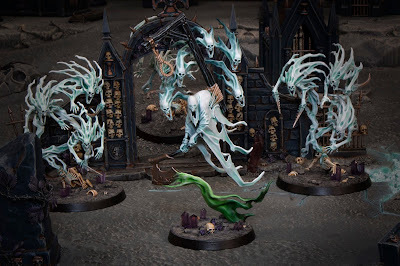 For the Nighthaunt you get a Knight of Shrouds on steed, a Guardian of Souls, a Spirit Torment, a Lord Executioner, four Grimghast Reapers, five Glaivewraith Stalkers, and 20 Chainrasps. The Stormcast get a Lord-Arcanum on Gryph-Charger, a Knight-Incantor, three Evocators, five Castigators, eight Sequitors, and a Celestar Ballista. That's a sizable amount for both sides. Me being me, I dived into the Nighthaunt models first. Everything in this box is push fit, even the bases! The bases either have slots in them (for a lot of the Nighthaunt models) or holes for pegs in models' feet. This means you'll want to double check that you're using the correct base for your model. In theory this means you could put the whole set together without any glue. That's great for beginners who just want to get the models on the tabletop. I decided to glue mine together though. Some past push fit models have had issues of gaps when the pegs won't go all the way into the holes. This often meant people just cut off the pegs when they glued it together. So far I haven't experienced any issues. Everything goes together smoothly with no major gaps. Most of the gaps that were there were easily taken car of by overfilling with glue a bit, then scraping down later with a hobby knife. There were a few here and there that I couldn't do that way that I'll fill with greenstuff, but you can probably get away without doing that if you don't want to. I'm just very particular about gaps on my models. All of the mold lines were pretty minor too, with most of them hidden along gaps and edges. The ones I did scrape away came off really easily. The Nighthaunt sprues were divided up with most of the heroes on one of the smaller ones, the Chainrasps on the other two small ones (it's just the same sprue duplicated with an alternate bit so you don't have to build two champions), and then the Grimghasts, Glaivewraiths, and Lord Executioner on the large one. All of the Chainrasps are either two pieces or one pieces, with most of the rest of the stuff being around three pieces. I haven't had a chance to put together many of the Stormcast yet, but they look just as easy to build. I'm already chomping at the bit to paint up my ghostly warriors. All in all, this is a fantastic set! This is just as good, if not better than the Dark Imperium box for 40k. The production quality is on the same level, and I would say the models are even better. The level of detail on them is incredible. All of the books are amazing, with the core rulebook being the best thing I've read for AoS so far. I'm currently still making my way through all of it at the moment. Around two-thirds of it is background on the timeline, setting, and factions. So much more gets explored and fleshed out. The rules are great improvements for AoS, with many of them previewed already. Having played AoS2 games for awhile now with play testing, I can confidently say this is the best AoS has ever been. You'll have to wait for next week though when I go over everything in the rulebook. My first model from the set I've painted up! If you're a longtime AoS fan, a new convert, a 40k players curios about the system, or someone completely new to Warhammer, there has never been a better jumping in point! Check back next week when I go over all of the lore and rules from the main rulebook! To think, I still have Malign Sorcery and the General's Handbook 2018 to review as well. This is going to be a very AoS packed month on Mengel Miniatures. Check out all the cool new content as well as the core rules for free on the official Age of Sigmar website!